Oftentimes, most builders and contractors are more concerned with the structure of a build rather than getting into the details of what kind of stone flooring should be installed. They may have the general idea that stone tile is needed, but when it comes to determining exactly which kind to select, it can become a time-consuming task. Because there are different variations of natural stone coloring, they are separated into certain categories according to the amount of veining, background color, and mineral composites. It is the mainly the mineral deposits that will classify a certain type of mineral from the other, even though they may look similar to the naked eye. A good example of two different types of natural stones looking alike is Crema Marfil and Saturnia Ivory Travertine Light. We will look into some of the differences between these two stone materials, what makes them unique, and their best uses. Crema Marfil is an organic marble mineral. It is considered a metamorphic rock because it is primarily made up of travertine that transforms over a long period of time from the pressure of tectonic plates moving together beneath the earth. Another strong factor towards its formation is the immense amount of heat it gets from the earth’s core. The process is quite amazing—that the earth has the ability to produce so much heat that it actually melts rock. Think of a volcano. Lava is nothing but melted rock, just like the formation of marble, except the process is slow and takes decades to produce. Example: If you were to take a ceramic plate and place a red wax cube on it, then hold it over a light bulb, over a period of time, the plate would warm up and slowly melt the wax into a liquid form. Now, if you were to add a yellow cube of wax onto the plate, it would also slowly melt into the red wax that has already melted. Then if you were to remove the plate away from the heat, the red and yellow wax would then cool, creating one solid multi-colored form of wax. This is similar to how marble is formed, except instead of wax, it’s travertine, calcite, clay minerals, micas, quartz, pyrite, iron oxides, and graphite along with any other biological debris that is near proximity of the “melting” process. What Makes Crema Marfil Unique? Crema Marfil is a natural marble tile that is primarily ivory in color with a slightly beige hue. It’s veining has a color that ranges in a yellowish-brown and red tones, giving the surface enough movement to complement most decors. Crema Marfil gives a warm, yet clean feel to a space making small rooms seem bigger and brighter while hiding dirt stains that might show up easily on an all white or darker-toned surface. Crema Marfil is best known to be installed as a flooring, However, because this brand is so durable and beautiful, it can be used as part of a built-in like wet bars, countertops, backsplash, showers, chair rail, and base boards. Crema Marfil also makes an impressive mantle for fireplaces. Depending on who your distributor is, marble can cost your company a significant amount of money. That is why it’s most beneficial to get your Crema Marfil at the lowest price possible. Crema Marfil can start as low as $3.95 per square foot and comes in 12″x12″x1/2″, 18″x18″x1/2″, and 24″x24″x3/4″. Saturnia Ivory Travertine Light is not made up of marble at all. It says so in the name! This natural stone is pure travertine with a honed, straight-edged finish. Unlike marble, travertine is made above the earth and is formed in caves or near hot springs. This is not a metamorphic mineral. It is simply formed through the accumulation of rapid precipitation of calcium carbonate from ground surface waters. This process often forms stalactites and stalagmites that you might find in caves. 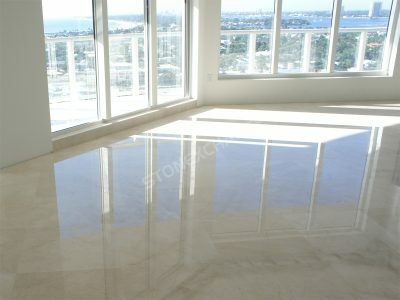 Because of how Saturnia Ivory Travertine is made, it is a bit more porous than the watertight marble. No heat was involved in its formation, so there is no smooth reflective surface. Color variations are few because the only organisms involved in its development process are siliceous sinter, macrophytes, bryophytes, algae, and cyanobacteria. All of these organisms get layered in during the precipitation process that causes the mineral to be so porous. Its porous properties aren’t so obvious to the eye more than it is to the touch. The Saturnia Ivory is perfect for humid and/or wet areas. Indoor or outdoor pools can be decorated with this stone creating a nice traction for what would otherwise be slippery a surface. Kitchens and bathrooms would also mask soap scum that shiny surfaces like a darker-tone marble might not. Saturnia Ivory also makes an impressive water feature. It is the perfect material for creating stunning outdoor furniture like benches, kitchenettes, and fire pits. Saturnia Ivory Travertine is considered the finest of all grades, having only 10% of its production is hand-selected making it a premium choice. Yet, travertine still cost less than marble. Saturnia Ivory Travertine starts as low as $2.95 per square foot and comes in 12″x12″, 18″x18″, and 24″x24″. Whichever stone tile you select, Nalboor Tiles is guaranteed to supply you with the best affordable prices. Nalboor is a wholesale natural stone tile distributor based in Miami, Florida. We are willing to offer you free samples of Crema Marfil Marble and Saturnia Ivory Travertine so you can see and feel the difference for yourself. Don’t waste another minute trying to determine which tile is the better one to stock. Get them both! In order to receive the maximum discount for your natural stone tile, it is recommended to order one full crate of the tile of your choice, or get both so that you will have a sufficient amount of inventory on hand to supply to your customers or building project. Place your order with us today by calling 305-501-4548 or contact us online. You can also email us right now with any questions you may have, and our knowledgeable staff of representatives will respond as soon as possible.